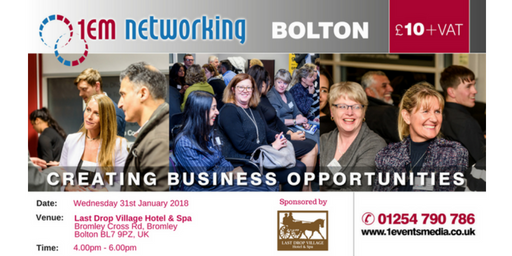 Folllowing the last event in Preston, 1 Events Media are pleased to announce the date of the next networking event for January 2018 taking place in Bolton (Last Drop Village Hotel & Spa, Bromley Cross Rd, Bromley, Bolton, BL7 9PZ) on Wednesday 31st January 2018 from 4.00pm-6.00pm. The event costs £10 plus VAT (includes Event Brite Processing Fee). Cancellation Policy: All Cancellations can be made directly via EventBrite and will receive a full refund if cancelled 7 days before the event.